The Tuck Room Tavern, a jovial neighborhood dining + drinking den serving craveable American fare and a touch of whimsy under the culinary direction of Chief Operating Officer, Restaurant Division, Chef Sherry Yard, is hosting Thanksgiving dinner for holiday guests with a four-course prix fixe menu from 4 – 11 p.m. on Thanksgiving Day. 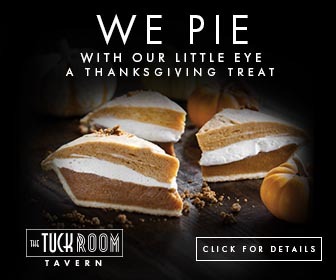 The Tuck Room Tavern’s cozy dining room decked with whimsical décor makes for the perfect backdrop to impress friends and family this Thanksgiving accompanied by an equally impressive menu by celebrated Chef Sherry Yard. Before the memorable evening comes to a close, guests will leave with a special gift from the chef. This prix fixe menu is priced at $55/person and $20 for children 12 and under. Reservation recommended. Enjoy the feast on Thanksgiving, Thursday, November 24 from 4 – 11 p.m.
A jovial neighborhood dining + drinking den serving craveable American fare and a touch of whimsy within a lively atmosphere, Sherry Yard’s The Tuck Room Tavern is now open in Westwood, California. Under the culinary direction of Chief Operating Officer, Restaurant Division, and three-time James Beard Award winner chef Sherry Yard and Master Bartender and Advanced Sommelier Adam Seger, guests can enjoy an extensive menu and handcrafted cocktails that present a liquid love letter to Los Angeles. The Tuck Room Tavern is tucked away inside iPic Theaters, located at 10850 Wilshire Blvd., Los Angeles, CA 90024. For reservations visit, www.thetuckroom.com or call: (310) 307-7004.